The only cure for senioritis is graduation. 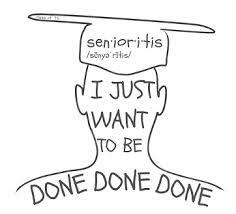 By this time, I’m sure you are experiencing or already have experienced the infamous “Senioritis”, basically when you’re completely over high school and have no motivation whatsoever to your academics. That constant routine of waking up to your 6 a.m. alarm, the same ringer you’ve heard for four years straight then the constant snoozing. Next thing you know, you’re dashing out the bed once you realize your “two more minutes” has turned to 30. If it’s getting harder to keep that drive to wake up and attend the glorious Parkdale High School just remember there are a few things in store. January: January of last year seemed to take forever but this year January seems to be flying by. January 25th marks the end of the first semester, that means we’re halfway through the year. Don’t burn your books in celebration yet, we still have one and half more quarters left. February: Known as the shortest month of the year, there are only a whopping 19 school days in the month. On February 8th Second Quarter Report Cards Released but 10 days later on February 18th, it is Presidents’ Day so school is closed. March: I’m going to be brutally honest, March is the longest month, you’re really going to have to push through this month. March 8th marks the day Third Quarter Progress Reports Released. 20 days later on March 28th is the end of the Third Quarter and the following day March 29th is a two hour early dismissal day. April: Spring Break! If that’s not the first thing that comes to your mind then I don’t know what’s going through your head. April 11th is the date Third Quarter Report Cards are Released. School’s out! From April 15th-22nd we are finally on a well-deserved break. Make sure you use this time to catch up on that missed sleep, binge watch shows and of course “finish” any homework which you probably haven’t even started. May: I hope the first thing that comes to your mind in May is Prom. While the date and time are unavailable right now, you definitely still need to be deciding on your color scheme for your suit or dress options. If you’re not going to Prom, that’s fine, the most exciting thing for you is the last day of school which is May 17th. Don’t completely forget about school though, Senior Fourth Quarter Progress Reports Released are released on May 10th. June: Ironically Fourth Quarter Report Cards are the same day of our graduation, June 3rd. The biggest thing is your four years of high school are finally over; no more bad cafeteria food, annoying hall sweeps and constantly being told to take off your hoodie. Whether it’s been the best four years of your life or the worse, there are bigger and better things in store for you. With that being said, see you all on June 3rd at The XFinity Center at 1:30 p.m and make sure you pack plenty of tissues just in case the teary eyes and sniffling noses come in.